…start using Sweave, from scratch! 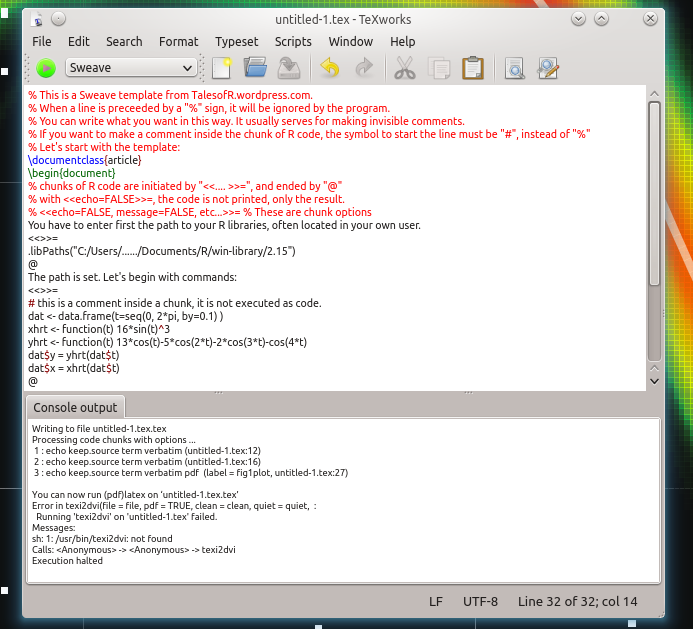 Sweave is nothing more, nothing less than one of the best ways R can connect with a text editor, in this case LaTeX. So you don’t know anyting about LaTeX? neither did I 8 months ago… The hyperlinks in this post will take you to some great pages, to learn different things in an organised way. Here’s how I did it (with lots of help from google though!). Second, you need to install R, from here. 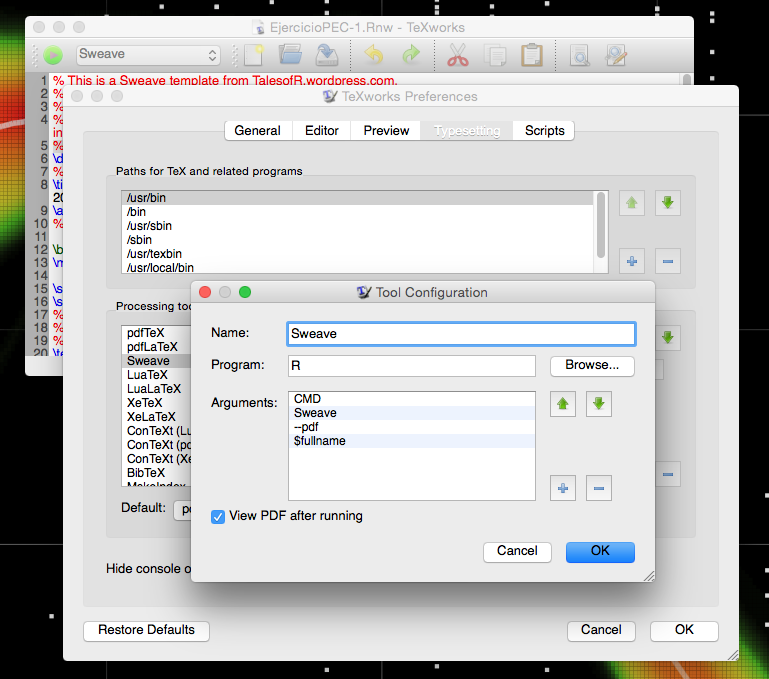 Once you have installed it, you will need to install a LaTeX distribution (my preferred LaTeX editor is TeXworks, and I have MiKTeX in MS Windows). For Linux users, here can be Kile (from KDE), TeXworks, or other alternatives. 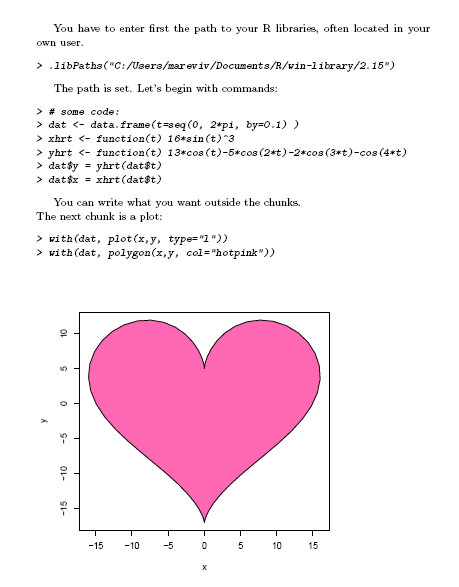 First of all you should install LaTeX (e.g. TeX Live), and configure it with these tips. 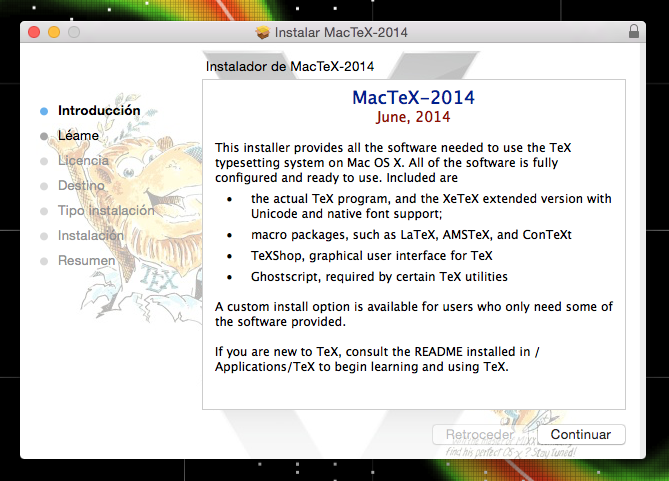 For Mac users, you can follow this link which provides instructions to install TeXmaker. You will be able to install TeXworks from here. NOTE: Both, MiKTeX and TeXmaker have portable versions, easy to carry in a pendrive! 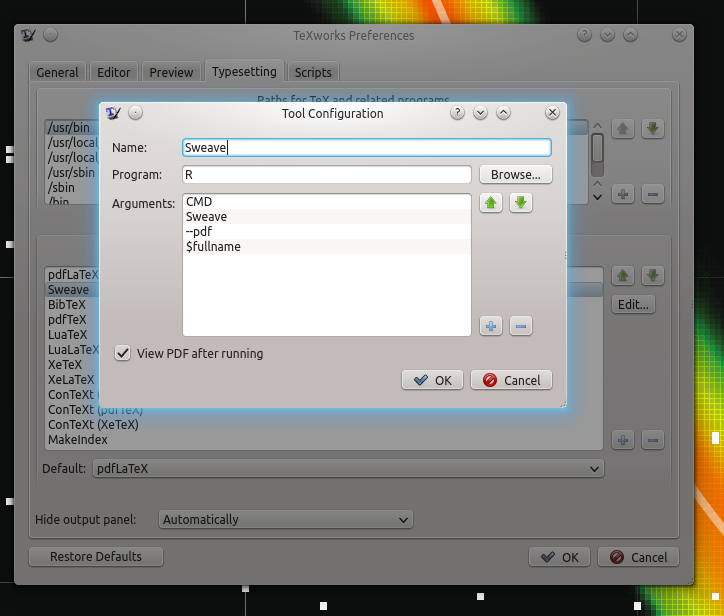 What TeX editor did you install? 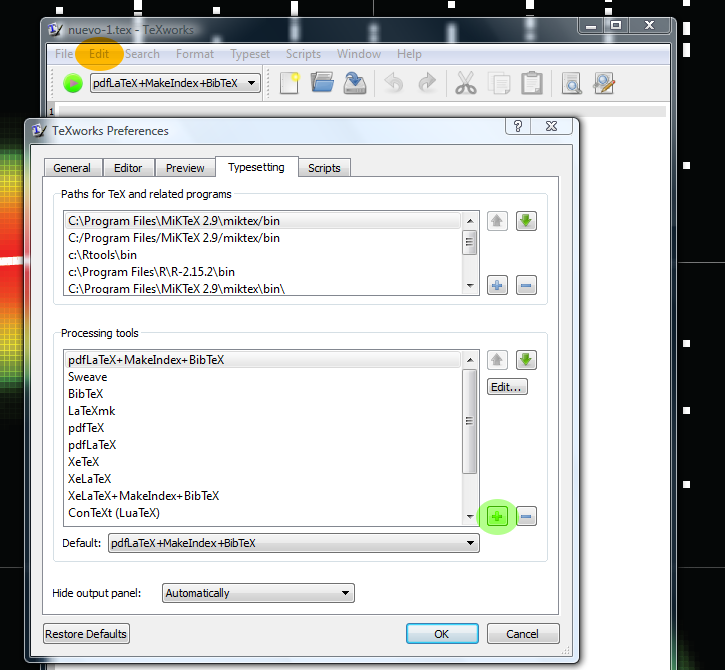 If you have TeXworks, the way to configure Sweave is pretty quick and easy. If you are a beginner, this may be the best option. You only have to fill in these fields with the name of the new tool, “Sweave” and adding its “arguments” clicking in the “+” sign. 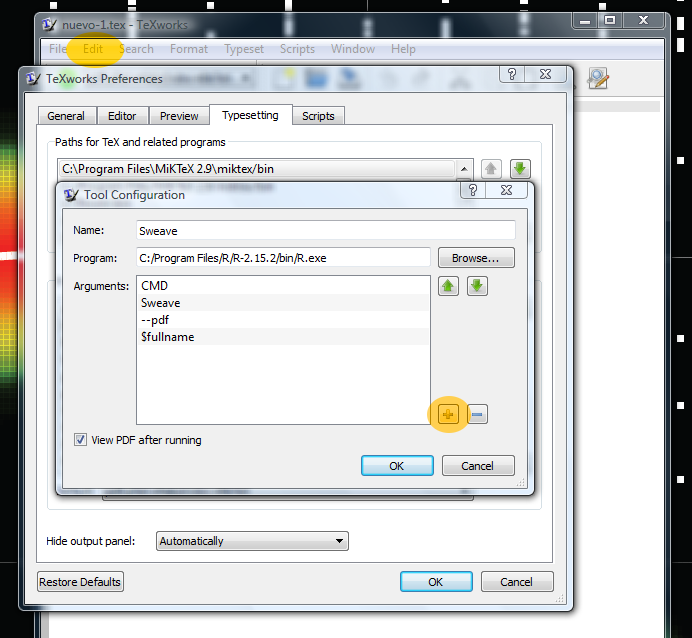 The field “Program” is filled with the path to your R executable, which can be similar to that in the picture. Just be careful to type “slashes” ( / ) instead of “backslashes” ( \ ). The field “Arguments” will contain all the commands that Sweave needs to connect to the R console, to interpret R’s code and to produce a .TEX file and a .PDF. Running ‘texi2dvi’ on ‘untitled-1.tex’ failed. Texi2dvi appears to be a script that allows direct compilation of a .pdf from a .Rnw file. This Sweave manual, updated in 2017 by Friedrich Leisch and the R-core Team. These Sweave customization tips, written by Ross Ihaka himself.